A Link (or 'hyperlink') is a piece of text, which when clicked takes you to another part of the site you are on (internal link), or to another website (external link). A link will normally be displayed as text, underlined and in a different colour, to indicate that it is a link. They can also be added to pictures too. Step 1: First either select a page to Edit from the Page Manager or create a new page. Once the page is opened, you will come to the Drag & Drop Page Editor. Once you have added your text, Highlight the text that you would like to turn into a Link. 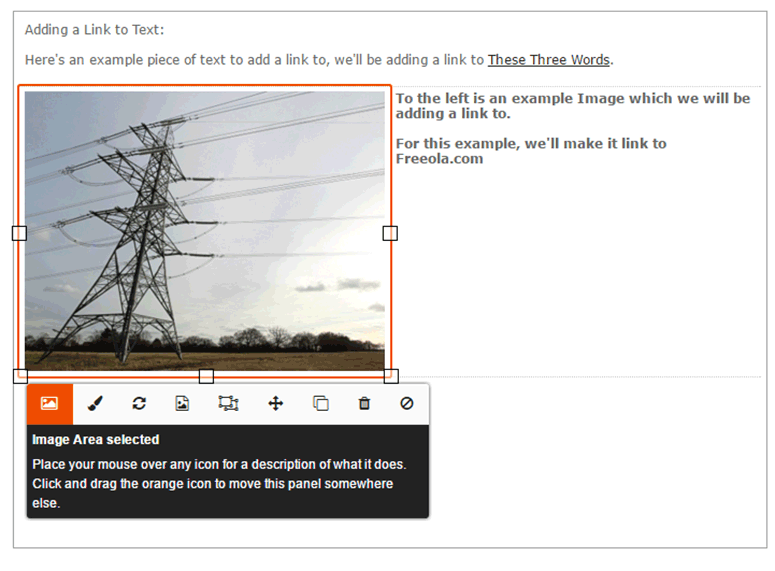 Step 2: Once the text is highlighted, click the Insert/Edit Linkbutton in the toolbar. 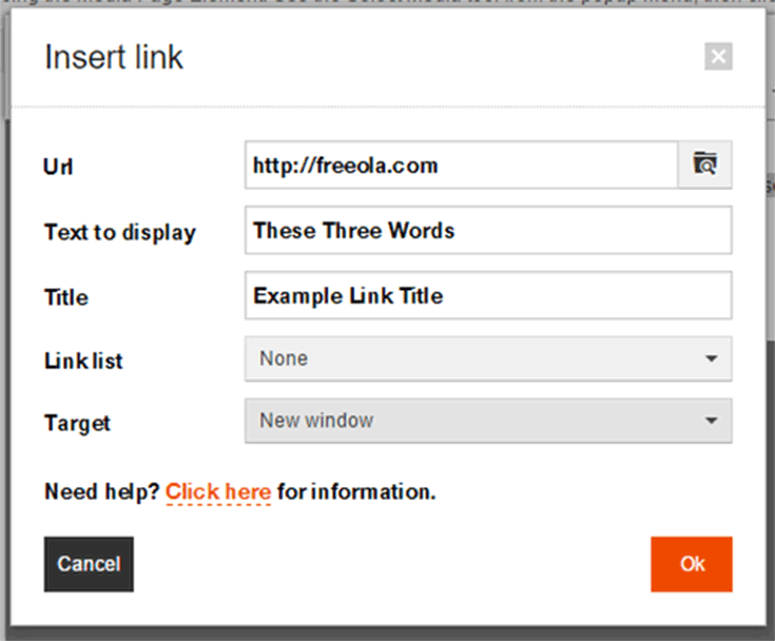 Step 3: You'll now be shown the Insert Link window. Here you can enter your URL (web page), choose a Title for your link and define the Target (whether to open the link in a new window). You can choose a link to one of your own pages by selecting it from the Link List. Once you are happy with the details click Ok. Step 1: Click on the Image that you want to add a Link to, and the Toolbar will appear below. 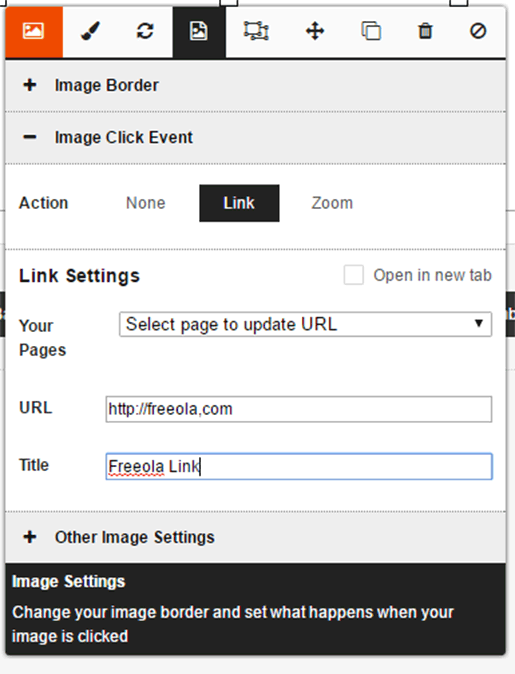 Step 2: Click the Image Settings button, then expand the Image Click Event option and select Link. Here you can enter the URL or select from one of your own pages using the Drop Down Menu, enter a Title and use the Check Box to decide whether you want the link to open in a new window. Once you are happy with the details press Ok.
You can customise your links (change the colour), to find out more on how to do this please refer to the Editing the Main Content Area Guide. If you wish to upload any documents or files for people to download, then please refer to the Uploading Documents & Files Tutorial.